Winter hardy to USDA Zones 4-7 where it performs well in hot sunny locations in dry to medium, relatively infertile, well-drained sandy or gravely soils. Tolerates poor soils. Good drought tolerance once established. Best left undisturbed once planted. Prune back after June flowering to encourage extended summer bloom. Genista tinctoria, commonly known as dyer’s greenweed and dyer’s broom, is a low-growing, green-stemmed, deciduous shrub of the pea family that typically grows to 2-3’ tall and as wide. It is native to meadows and pastures from Europe to Siberia. It has been introduced into North America where it has escaped gardens and spread, sometimes invasively, in parts of Quebec, Ontario, northeastern and north central U.S. plus Virginia, Mississippi and Washington, with naturalization concentrated in coastal areas from New England to Virginia. Shrubs feature elliptic-oblong to oblong-lanceolate, hairy-margined, rich green leaves (to 1” long). Golden yellow pea-like flowers (each to 3/ 4” long) bloom in erect terminal racemes in June often with sporadic continued bloom extending throughout summer into September. Flowers are followed by 8-12 seeded narrow-oblong pods. Seeds ripen from August to October. 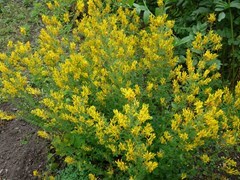 A quality yellow dye can be obtained from the flowers and young shoots. Plants grown for production of yellow dye are often grown as biennials (entire plant is dug up for harvest in the second year). Genus name comes from the Latin name planta genista from which the Plantagenet kings and queens of England took their name. Specific epithet means used in dyeing. The young shoots and stems from some of the taller plants in the genus were once bound together for use as sweeping brooms, hence the common name of dyer’s broom. Green stems plus weedy growing habit resulted in the common name of dyer’s greenweed. No serious insect or disease problems. Potential diseases include fungal blight, dieback, powdery mildew and rust. Good low growing shrub for poor dry soils. Borders. Foundations. Rock gardens. May be grown as a ground cover. Invasive tendencies should be monitored and addressed as needed.